We are reading chapter books for the next couple of weeks, thinking carefully about the characters in these books, and considering how we might support students in author studies. 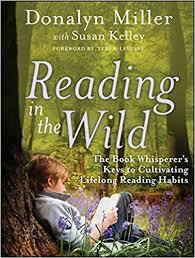 I’ll also ask you to read Miller’s chapter 2 and imagine what you’ll need to do to grow as an educator who can support wild readers. The chapter books we are reading are some of my favorite new(er) children’s books and I’m hoping you’ll enjoy them! 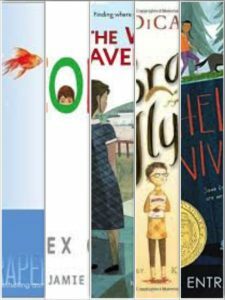 All of them are award winning books, mainly Newbery winners (as a future teacher, you should just bookmark the Caldecott and Newbery page). Respond to Prompt: What are take aways for you from Miller’s second chapter? Point to specific places in the chapter that you find interesting, puzzling, eye opening. Consider: what will you need to do in your professional life to be able to create “preview stacks” for students like Miller discusses on page 73? How close are you to being the kind of elementary teacher who can recommend so many different kinds of books? How will you grow no matter where you’re starting from? What advice does she offer in this chapter that you would consider trying out now? I would expect you to write 3-4 meaty paragraphs in response to chapter 2. Post in G+ Week 6: Miller Ch. 2 Discussion. Read at least half of your chapter book. What are his/her physical characteristics? How does he/she interact with other characters? How does he/she interact with the world around him/her? What are this character’s behavioral traits? Choose a sentence or two that is significant for this character. What do we learn about this character from the passage you’ve selected? What do we know about children/childhood from this character? To Do: 1) Read through this resource (<–link) about how and why you might consider doing an author study. Then, 2) do some research on your chapter book author. Do they have a website? Interviews you can read or watch? Google them and see what you can discover. To Write: 1) Share with us what you learn about the author (and consider attaching a link we might find useful: a website, an interview, a link to a resource about their book(s)). Then, 2) share what might you be able to use from the author study resource plan from Reading Rockets? What interested you that you might consider for your own classroom? Again, you have a lot of choice in how you decide to share your chapter book. The goal: share your book in a creative way with others so that perhaps they too can get excited about reading the book. Another goal: use the make as a way to think about the ideas/themes/characters in the books we are reading. Try out making something that you might ask your future students to make. You can create a piece of art, a book trailer or short film, write a song, write fanfiction, create a game, create a lesson plan or class activity…lots of possible ways to share. You can upload an image of your artifact, share a link, share a video, etc. And again, no word search or crossword puzzles as makes. Your last two makes have been fabulous, so not too worried about this.